Tigercat’s new 880 machine is proving to be a fuel-sipping processor, while still delivering the goods, at Suncoast Logging on the west coast of Vancouver Island. 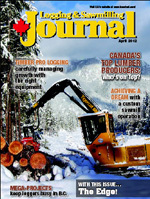 Read all about the 880 at Suncoast Logging and an 880 purpose-built log loader at Blue Valley Enterprises in B.C.’s Central Interior in the May/June issue of Logging and Sawmilling Journal (Photo by Paul MacDonald). Fueled by high commodity prices and demand in Asia, a slew of resource industry-related mega projects in B.C. could keep loggers busy doing right-of-way clearing and site prep work for some time. With steady investments in equipment upgrades, Gaetan and Rheal Roussel have developed a rock-solid reputation for high production and consistent harvesting in the New Brunswick woods. Mardis Forest Products owner Larry Gould has endured the trials of tough business conditions in the forest industry—but is now seeing the achievement of a lifelong dream with his successful custom sawmill in the B.C. Interior. Alberta’s Timber Pro Logging is carefully managing growth, and making the right equipment decisions—including an investment in some John Deere equipment this past fall—has been key to their success during a time of tight profit margins. Included in The Edge, Canada’s leading publication on research in the forest industry, are stories on FPInnovations, Natural Resources Canada, the Canadian Wood Fibre Centre and Alberta Innovations – Bio Solutions research projects. Logging and Sawmilling Journal’s authoritative listing of the Top Lumber Producers, from industry consultants International Wood Markets Group, shows who’s up and down in lumber production. Operating in remote locations along the B.C. Coast, logger Doug Sladey requires solid, reliable equipment—and he is getting that reliability, and performance, from a fleet of Hitachi purpose-built Foresters. The economic downturn has led to the forest industry re-inventing itself, says Avrim Lazar, who recently retired from a decade leading the Forest Products Association of Canada. The horrific January explosion and fire that destroyed the Babine Forest Products sawmill near Burns Lake, is revealing what little we really know about the composition of public forests in the British Columbia Interior, says Jim Stirling. The forest industry is always looking for the best information and planning tools to help it assess its footprint on the environment and to help it make informed planning decisions to minimize that impact. Alberta Innovates Bio Solutions (AI Bio) and several members of the forest industry have provided financial support and input to a group of researchers working on the Natural Sciences and Engineering Research Council of Canada (NSERC) ‘FORWARD II’ research project. FORWARD stands for ‘Forest Watershed and Riparian Disturbance.’ Its aim is to compare industrial activity in the forest with natural, large-scale disturbances such as forest fires and the role that disturbance plays on the forest landscape. FORWARD II recently completed its work, and in doing so, has given the industry a new perspective, particularly to better predict the impact of its operations on stream flow and water quality. It has also provided tools to incorporate into the industrial planning process to both assess the impact of current operations and to predict the likely impact so that harvesting plans can be tailored to minimize their impact on stream flow and water quality. In a nutshell, the FORWARD II research results help direct industry and government in the amount, pattern and timing of operations to sustainably manage boreal forest resources. More specifically, FORWARD developed models to predict stream flow and water quality with and without vegetation change, demonstrated the role wetlands and riparian areas have in regulating water movement and developed a framework to incorporate results into the industrial planning process. It also expanded into two areas of interest, those being impacts of forestry on soils and amphibian use of the forest. 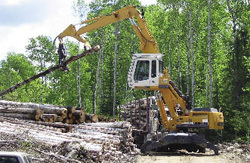 FORWARD outcomes not only improve the forest industry’s ability to limit disruption of boreal ecosystem function, but they include tools that can be calibrated and transferred to other forest areas for use by Canadian companies, with applications also possible in other resource-based industries. That is in fact happening, as a FORWARD III research project has been developed, taking the research findings and tools developed by both the FORWARD I and II teams, and applying them to land base management research pertaining to the oil and gas industry. FORWARD II researchers and students, many of whom were from Alberta, collected comprehensive weather, atmospheric deposition, soil temperature, moisture, nutrient and microbial community, wetland, vegetation, amphibian, stream flow and water quality data from 29 watersheds on the Canadian Boreal Plain in Alberta and Boreal Shield in Ontario, building upon a database developed in the FORWARD I research project. 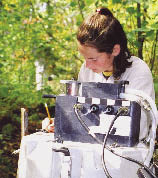 In addition to financial support from AI Bio, the FORWARD II research project was also supported in Alberta by the Forest Resource Improvement Association of Alberta, Millar Western Forest Products, ANC Timber Ltd., Blue Ridge Lumber Ltd., Vanderwell Contractors (1971) Ltd, Alberta Advanced Education and Technology, Talisman Energy Inc., and PetroBakken Energy Ltd.
Dr. Ellie Prepas, Principle Academic Coordinator on the FORWARD II project, says AI Bio Executive Director Steve Price and AI Bio Director of Forest Products Innovation Ted Szabo were highly supportive of the research project. “We were very pleased with the level of support we received, which allowed us to do the project as well as allowed the participating students to be trained on an industrial landscape and in a very co-operative environment,” says Prepas. 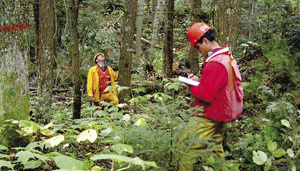 In terms of practical application, the tools developed by FORWARD II research were applied by Millar Western Forest Products and ANC Timber Ltd. Jonathan Russell, former Woodlands Manager for Millar Western, was among those supporting the project work at every stage and helped raise funds among the industrial partners for the project. Russell has 35 years’ forestry experience and described FORWARD II research as “an extremely good tool” for helping industry assess its forest footprint and for implementing changes to mitigate industry’s impact on the forest environment. Russell says FORWARD tools have been used in two ways. They were applied as an after-the-fact model assessment tool by planners as they developed their annual allowable cut scenarios. The tools were used to determine if a planned harvest in any area within the harvest model impacted negatively on water quantity. That is how ANC Timber used the tool. Alternatively, Millar Western incorporated a FORWARD tool as a constraint within their annual allowable cut modeling exercise, so that when planners predicted a certain amount of water runoff within specific areas within each annual allowable cut model, the tool created an alert indicating that water quantity loss would exceed set parameters and that a new type of cutblock spatial distribution was needed. Russell says using the tool in this way did not constrain the annual allowable cut, but it did influence how the cutblocks were distributed. “We found that both uses were very informative for the companies when developing an allowable cut and a spatial distribution,” says Russell. For more information on this project, read the final report at www.biolink.albertainnovates.ca and search on “AFRI-826G-11.” For more general information about FORWARD II research findings and tools, visit www.forward.lakeheadu.ca or contact Dr. Ellie Prepas at (807) 343-8623 or eprepas@lakeheadu.ca. For almost four years, DiagFor, a diagnostic kit developed by FPInnovations, has been helping forest contractors improve their operations. Although DiagFor can be seen as a benchmarking, assessment and continuous improvement tool, it is first and foremost an online self-evaluation questionnaire designed to develop a company profile based on various areas of activity. The process requires a computer with Internet access. No specific software package is required. The DiagFor questionnaire is subdivided into eight sections which, together, cover the set of responsibilities of a forest contractor, from optimizing equipment utilization rate to human resources management, quality control and the environment. Each responsibility is analyzed with respect to six performance levels. The diagnostic tool allows the contractor to measure the performance of his operations with respect to each responsibility. The user simply answers questions by clicking on “Yes” or “No” and is guided through progressively more challenging levels. Depending on the level reached for a given responsibility, DiagFor suggests continuous improvement possibilities, proposes various readings and lists relevant Internet links. It should be noted that very little personal information is requested in this process and that results are confidential. Log on to www.diagfor.com.today and give DiagFor a try. Diversity is a good thing in nature as diversity improves ecosystem resilience. When it comes to wood supply, managing variability in fibre characteristics, tree size, and growth rates is a good thing, too, lowering handling and manufacturing costs and creating more consistent product quality. Maintaining nature’s diversity combined with managing variability in wood characteristics and increasing growth rates in plantation forestry is the goal of an emerging research program from the Canadian Wood Fibre Centre (CWFC) and a broad-based consortium of provincial governments, academic institutions, and the forest industry, which collectively support the National Network of Somatic Embryogenesis Laboratories. Many countries are capable of growing timber more rapidly than Canada because of favourable climate. Canada can compete globally, however, by producing superior quality wood fibre in economically significant volumes—and at the fastest rates possible given our growing conditions. Some 640 million trees are planted annually in Canada. Innovative methods are needed to maximize the productivity and quality of these plantations for a competitive wood supply. Rapid growth of desired fibre attributes is important, but equally important are trees of consistent size and quality with resistance to pests and adaptability to a changing climate. The Canadian Wood Fibre Centre and its research partners have developed an advanced approach called multi-varietal forestry (MVF) to boost the gains of conventional tree breeding techniques. 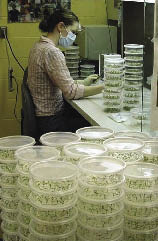 Tree breeding programs form the critical basis for the application of MVF. Using advanced technologies for mass propagation (somatic embryogenesis) and cryo-preservation, MVF increases productivity, quality, and volume gain in forest plantations. Test results show that it is the only tool that increases wood production without compromising commercially important wood properties such as density. MVF provides a new level of knowledge about tree quality to enable forest plantation managers to carefully deploy the right planting stock to the right sites for optimal plantation performance. With confidence, managers can forecast plantation output, plan wood supply for particular end products, and conduct realistic financial analyses to evaluate silvicultural investments over time. Research results with white spruce on prime growing sites in New Brunswick show that MVF increases volume gain by 20 per cent to 50 per cent over conventional seed orchard output. Carried forward, this gain would reduce time to harvest to 35 years from the usual 45-year rotation. Managers can anticipate trees of predictable size and quality to economize sorting and transportation costs. Along with other technologies aimed at optimization of the forest value chain, MVF offers managers an advanced tool for the production of superior quality wood fibre in economically competitive volumes and time scales while maintaining a high level of genetic diversity. This combination of gain while retaining diversity is what gives MVF a unique edge over traditional tree breeding outputs. As with all innovation, there is an upfront cost to implementation that should be evaluated against future profitability. Mechanized production systems linking laboratories, greenhouses and nurseries will help reduce the operational costs. Continued technology development will refine MVF as a tool for value-oriented forest management planning. J.D. Irving Limited sees strong benefits for their company and the forest as well. “We have worked collaboratively with Dr. Park for many years and see strong benefits of multi-varietal forestry on part of our forest landscape.” says Adams. MVF is a new tool that Canada is developing in the ever competitive global forest products sector. Steve D’Eon is a Knowledge Exchange Specialist with the Canadian Wood Fibre Centre of Natural Resources Canada, which works with FPInnovations to optimize wood fibre value. 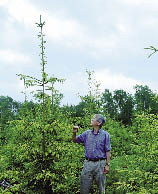 For more information on multi-varietal forestry, please contact: Dr. Yill-Sung Park, ypark@NRCan.gc.ca or (506) 452-3585. 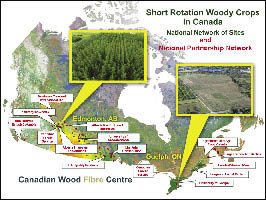 The Canadian Wood Fibre Centre’s (CWFC) goal of developing, assessing and presenting short rotation woody crop system options to landowners and investors as a viable commercial venture requires an integrated approach to both management regime designs and product options, and environmental values. This work has created a number of potential management regimes to meet specific objectives for wood, pulp, bioenergy and biofuel products as well as clean air, water and land values. However, it would not have been possible for the CWFC team to have come this far this quickly without the support of a network that has evolved over the past decade as part of this endeavor. “During the evolution of developing the short rotation woody crop systems initiative over the past 10 years, the Canadian Forest Service and CWFC, through the silviculture and afforestation innovation group, have developed a national partnership network and a network of technical development sites across Canada,” says Derek Sidders, CWFC Regional Coordinator for the Prairies. He adds that without this network, CWFC researchers and developers would not have been able to maintain its focus, thrust and movement forward from both a research and reality perspective. “We wouldn’t have been able to justify the investment and maintenance in the infrastructure, and we wouldn’t be getting this nice balance between practical and theoretical research and development,” adds Sidders. The network brings together individuals working in government research and development agencies, universities, provincial governments, forest industries and landowners from coast to coast. They provide the CWFC with answers to the myriad of land use, environmental, scientific and economic questions that arise when growing short rotation woody crops commercially throughout Canada’s many geoclimatic zones. This technical support network is complemented by a national network of technical development sites, which have been critical when CWFC presents the opportunity to investors and landowners. They also provide network researchers with field laboratories to conduct their particular research. It’s a great fit. The primary CWFC team of Derek Sidders, Tim Keddy and Brent Joss have developed several systems for growing short rotation woody crops, methods for managing and monitoring technical development sites, and recommendations for potential products by looking at the overall supply chain. Dr. Jagtar Bhatti, Dr. Barbara Kishchuk, Dr. Carmela Arevalo and Dr. David Price from the Canadian Forest Service are conducting focused research in the areas of carbon budget monitoring and sustainability issues as it relates to soil fertility and water use. Dr. Naresh Thevathasan, Dr. Andrew Gordon and their graduate students at the University of Guelph, one of CWFC’s primary partners and host of one of its major technical development sites, have written numerous research papers and produced very focused research documents related to site management practices and how they relate to production and environmental issues and lifecycle analysis. Dr. Andrew Black and Dr. Rachhpal Jassal at UBC have contributed by establishing flux towers in various technical development locations, particularly on the Prairies, which track water use and carbon exchange in the atmosphere. Dr. Shahab Sokhansani at UBC has studied mid-supply chain indices as they relate to the handling and conditioning of biomass, converting it into pellets, and looking at the physical and chemical characteristics of pellets and processed biomass. Dr. Philippe Savoie and the team at Agriculture and Agri-Foods Canada in Quebec City have worked with CWFC to engineer, develop and patent a bio-baler for use in recovery of very short rotation woody crops. Dr. Gordon Falk and his team from Manitoba Conservation have been active partners in adopting developed management regimes and operational practices into their Trees for Tomorrow program, which promotes afforestation on non-forested lands in Manitoba. Forest industries in Alberta, B.C. and Ontario are supporting the short rotation woody crop system development by deploying it on their sites, assessing management practices, validating growth potential, and testing recovery and handling practices. Landowners in northern B.C., the Prairie provinces, Ontario and Quebec have established developmental and operational plantations using CWFC and partners’ best practices. “The landowners have been the nucleus of our supply chain analysis work and have also been involved in analyzing the effectiveness of various management regimes on various sites and regions, as well as the recovery of biomass and the validation of growth trajectories,” Sidders says. The CWFC team would like to thank the program partners and hosts of the national network of sites across Canada for their commitment to the ongoing success of the program. For more information about the CWFC short rotation woody crop initiative, contact Derek Sidders at (780) 435-7355 or dsidders@nrcan.gc.ca. Amidst new opportunities, especially in the emerging bioeconomy, Canada is poised for a leaner, faster, stronger forest industry. As a result, there is a need to present a functional model to the industry where decisions are taken considering the whole value chain. In order to take advantage of the promising bioeconomy, the industry needs tools to enable new biopathways. Having identified such needs, FPInnovations has launched a new Value Maximization and Decision support program, which aims to optimize the forest sector value chain. Simply put, this new program will help members generate more value from their wood basket. This collaborative program will create a distinct, cross-organizational program not nested within existing programs, aiming to develop tools and expertise that leads to an enhanced, value-enriched forest sector economy. Working closely with ongoing Canadian Wood Fibre Center (CWFC) activities, the program aims to become a more effective receptor and advisor of the Natural Sciences and Engineering Research Council’s Value Chain Optimization (VCO) network program, led by Université Laval (Québec). To maintain its global leadership, Canada needs to overcome major challenges around supply chain agility, business models and competition from other countries. This is where the Value Maximization and Decision support program comes in. The initiative seeks to implement practical solutions at the operational level, while taking into consideration the capacity of the industry to change its behavior and business models. It will address tactical and strategic issues at the national, provincial and regional levels to foster better decisions to increase value coming from our forests. The program is geared towards supporting the industry in applying VCO concepts, ensuring that models and solutions proposed by the NSERC VCO network projects are viable and adapted by the industry. Better fibre from the forest: The emphasis is on value-based forest management practices, improving the decisions around merchandizing and segregation of logs, as well as improved knowledge of forest and tree attributes. Fibre product flow from forest to markets: It will turn the spotlight on improving transport logistics and inventory control systems along the value chain. Supply chain agility: It will look into multi-link decision-support tools along the value chain, the responsiveness to customer demands, flexible regional industrial networks and new business models.